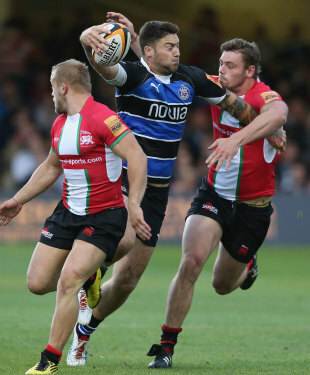 Bath Rugby have played down the injury Matt Banahan sustained against Wasps describing it as a "nasty strain". There were original fears that England winger-come-centre Banahan would be out for a lengthy spell after he limped off the field in the Aviva Premiership clash. But Bath have allayed these in a statement saying: "Matt Banahan went to the Circle Hospital for a scan on his knee last week and the results were better than perhaps we had feared. He has suffered a nasty strain and some bone bruising but there was no significant damage to any ligaments, which is great news." Samoan Test prop Anthony Perenise has also been sidelined but Bath say that he is back in training and has "encountered no problems". The news over World Cup-winning fly-half Stephen Donald is more ambiguous though. Fellow fly-half Tom Heathcote is currently sidelined and Donald has also missed their first three matches of the new season. While Bath do not explain what his injury is, they reveal that he is currently being monitored by their backroom staff. "Stephen Donald has also been running with the team again, but his re-introduction is more complex," read a Bath statement. "Will Owen, one of our strength and conditioning experts, monitors exactly how many metres Stephen runs in a session via a GPS unit and pulls him out when the exact required load is achieved. "This level of care and control is important and means that players return from injury in optimum shape and that the injury is less likely to reoccur, giving the coaches as many healthy bodies as possible from which to choose come selection time."